Photo: Home at 205 Bamberg Street, ca. 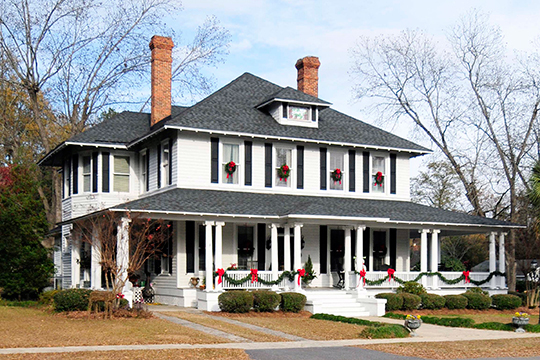 1900, Latta Historic District, Latta, SC. The Historic District was listed on the National Register of Historic Places in 1984. Photographed by User:Bill Fitzpatrick (own work), 2012, [cc-by-3.0 (creativecommons.org/licenses/by/3.0)], via Wikimedia Commons, accessed October, 2015. Dillon County Administrative Offices are located at 109 South 3rd Avenue, Dillon, SC 29536; phone: 843-774-1400. Dillon County  was established in 1910 from the northern part of Marion County, and the town of Dillon became the new county seat. The population of Dillon at that time was 3,000. The business of government joined the growing community and in 1911 the Dillon County Courthouse, designed by William Augustus Edwards, was completed. Maggie Riales, Revitalization Coordinator for the City of Dillon with SHPO Staff, South Carolina Department of Archives and History, Dillon Downtown Historic District, Dillon County, SC, nomination document, 2002, National Park Service, National Register of Historic Places, Washington, D.C.